On my way to Dublin I regularly stop to stretch my legs at The Outlet Village, Banbridge. Crescent shaped in two rows, it allows patrons to walk a wide open air pathway between the stores. Like all cities, towns and shopping malls, there are the marks of recession with shops closing. This particular outlet, dressed the windows of these empty units, taking away that depressing look. Several units were used for other purposes to draw in the crowds. On 10 July, I stopped for my usual walk, a coffee and a freshen up. 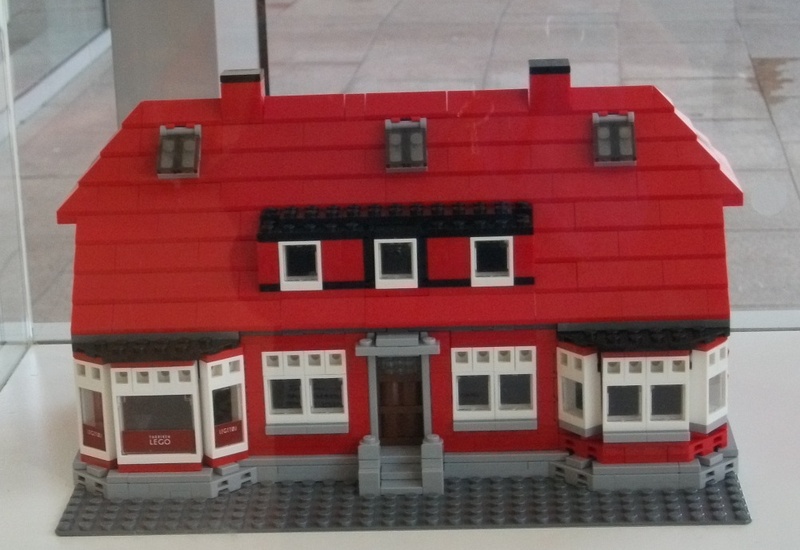 It was with fascination and delight that I discovered The Big Brick Exhibition in Unit 27. Every item on display was pieced together at the hands of one young man: 25 year old Michael Finan of Banbridge, Northern Ireland. 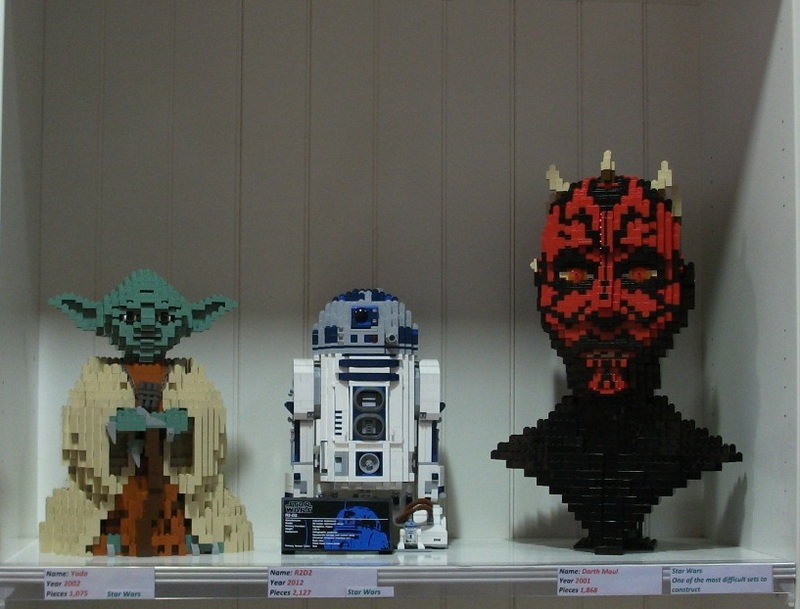 A Collection of Lego Models, which he began at 5 years of age. Old Kirk’s House, was not normally on sale to the public. It was a gift for employees at Lego, but Michael was fortunate to purchase it on eBay. I attempted to make a spur of the moment video on my phone. Alas I used portrait instead of landscape mode and it picked up all the background noise, which I am not clever enough to filter. A gallery of photos will have to suffice. In 1999, a Christmas gift from an aunt & uncle set him on the pathway of Puzz 3D jigsaws. Their gift: a 1438 piece 3D jigsaw of Big Ben. Feeling daunted be began with the smaller Normandy House, a mere 225 pieces. It was enough, Michael was hooked! At this stage, he has built most of the Puzz 3D jigsaws that have been produced to date. The exhibition will be open to the public during business hours until 27th August 2014. Darth Maul was the most difficult to build and Michael told me it fell over at one stage during the building, so he began all over again – all 1,868 pieces. R2D2 had 2,127 pieces, but Yoda (if memory serves me correctly) had a massive 3,075! 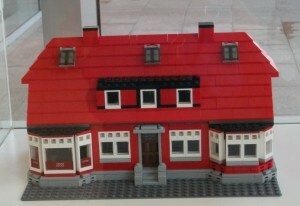 This entry was posted in Fun and tagged 3DJigsaws, Exhibition, Lego (interest), Michael Finan, The Big Brick Exhibition, The Outlet Centre on July 25, 2014 by Grannymar.